Sit-stand desks are desks that can adjust in height, allowing employees the option of choosing to either sit or stand while they’re working. Sit-stand desks have been growing in popularity because of the health benefits they provide to users. For example, standing for part of the day instead of sitting all day can help prevent neck and back pain, and has also been linked with a reduction in obesity and heart disease. It is also important to be able to sit sometimes, as well, so users don’t get too tired. These desks easily adjust from standing to sitting height so users can get off their feet for a while. These benefits and more make the high-quality sit-stand desks available from NorthPoint Office Furniture the perfect choice for your Alpharetta, GA office. 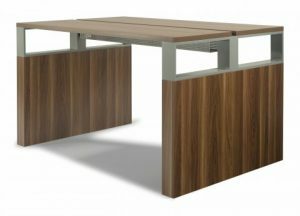 Not sure how a sit-stand desk will look or fit in your Alpharetta, GA office? No problem, our team will be glad to answer all of your questions and show you around our 8,000-square-foot showroom, where you can look at our sit-stand desk displays in an office setting, test them out, and envision how they will look in your office. Plus, we will assemble your sit-stand desk for you at no additional charge, saving you the frustrations that can come with setting up furniture and allowing your employees to start benefitting from their new sit-stand desks immediately. If you think that sit-stand desks could benefit the employees at your Alpharetta, GA office, then contact the helpful office furniture experts at NorthPoint Office Furniture today.